Of all the things you might want to resemble after a luxurious bath – mermaid, goddess, movie star – Shrek is certainly not one of them. Nicky Kinge from Southampton, England was all set for a peaceful soak in the tub with her new ‘Secret Arts’ bath bomb from Lush. 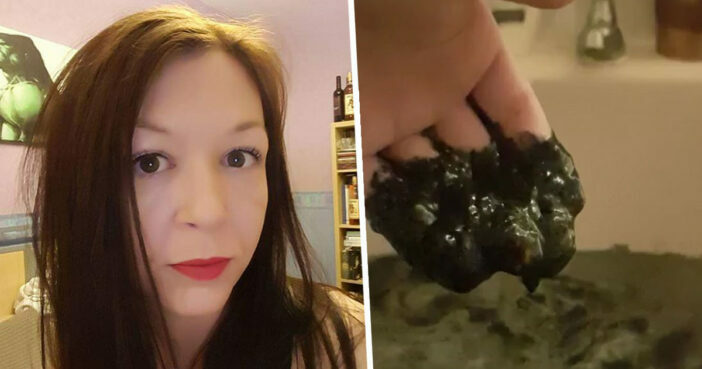 Being a long-time Lush shopper, 34-year-old Nicky understandably assumed she was in for some quality relaxation time as she chucked the £5.25 bath bomb into the tub. However, the casino worker was left feeling ‘dirty and freaked out’ after the bathwater was transformed into a swamp befitting grouchy ogre Shrek, coating her skin with ‘thick black slime’. Far from feeling squeaky clean, Nicky actually felt dirtier after submerging herself in the water. She only lasted for three minutes before hopping right back out again, and even had to use her downstairs shower to clean the slime away. I did feel a bit like Shrek – it was funny. The only way I could describe it to friends is when you used to watch Fun House and they would pour slime over people – it felt like I was in gunge. I was planning to stay in the bath quite a bit. I usually just sit in there, lay back and relax in there for about half an hour and just switch off. 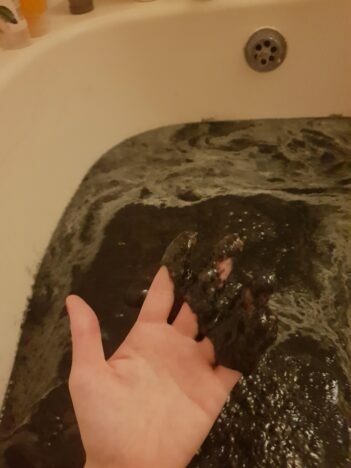 It felt extremely slimy and it was really thick and because it was so black it just made me feel like I was getting dirty and freaked me out. At that point I did think ‘I can’t stay in here’ and I had to get out. It was difficult to get out because the gunge was sticking to me so I had to splash water on myself to try and wash it off. My shower is downstairs so I couldn’t just start running a shower straight away, I needed to try and get it off so it was a bit of a challenge. Moments after lowering herself into the gungy bathwater, Nicky realised her mistake. 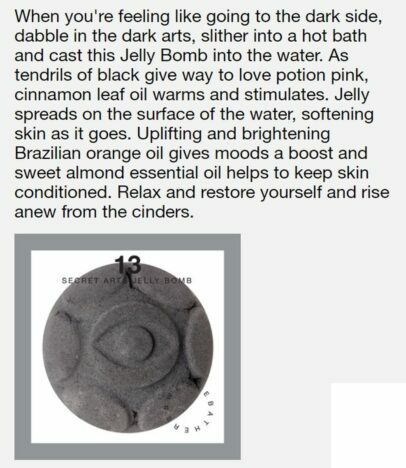 She’d mistakenly picked up a jelly version of her go-to bath bomb while shopping at Lush, hence the surprising consistency. However, despite the strange texture and appearance of the bath bomb, Nicky admitted her skin felt ‘amazing and so soft’ following her super short soak. I use Lush all the time but it was the first time I tried a jelly bomb, I usually just pick up standard ones. I quite often pop in there and pick up a couple of things and look for products I haven’t tried before. That evening I filled the bath up and then put the bomb in, the water looked really black but I thought I’d give it a go. When I got in I was like ‘yeah that’s different’. It looked exactly the same as the usual bath bombs I use because the jelly’s inside. It was only when I got in the bath and looked at the packet that I realised. I only lasted three minutes in there before I had to get back out. 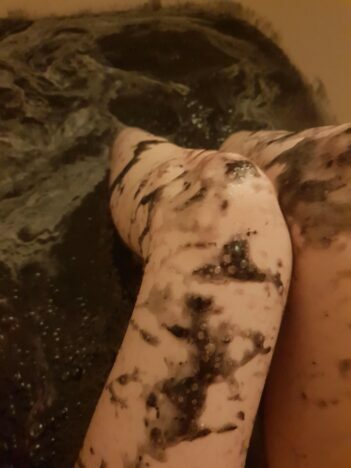 Even though I was only in there a short amount of time it left my skin feeling amazing and so soft, it felt really, really nice. Thankfully by the time I’d dried myself off the jelly had dissolved, it was just a case of rinsing it out like you do with other bath bombs. I’ve been using Lush products for a few years. I love their bath bombs they have a lot of essential oils in so they always leave your skin really nice. From there I’ve tried some of their soaps and shampoo bars, I’ve always had good results with them. I’m not sold on this one because of the colour, but I wouldn’t avoid jelly bombs in future. I’ll just be sure to avoid the ones that look like you’re sat in dirty water.